Casual with a contemporary flair, this charming chandelier is perfect over breakfast or diming table. A smart drum shade add distinction and provides pleasing illumination to your room. Use as a standalone style or coordinate with the Gather or Inspire collection from Progress Lighting. Black banded fabric shades and clear glass accents for contemporary industrial design. Includes 6 feet of chain for height adjustments. Fixture attaches to matching decorative ceiling plate and is suitable for vaulted ceilings. Vintage mid-century modern, the Alexa Collection features a pleasingly simple brushed metal frame. Visually interesting white linen finish glass with a crisp clear edge accent. Create the sophisticated feel of modern, urban living in your home - no matter where you live. 5-Light Chandelier in Brushed Nickel with Beige Linen Shade Casual with a contemporary flair, this charming chandelier is perfect over breakfast or diming table. A smart drum shade add distinction and provides pleasing illumination to your room. Use as a standalone style or coordinate with the Gather or Inspire collection from Progress Lighting. 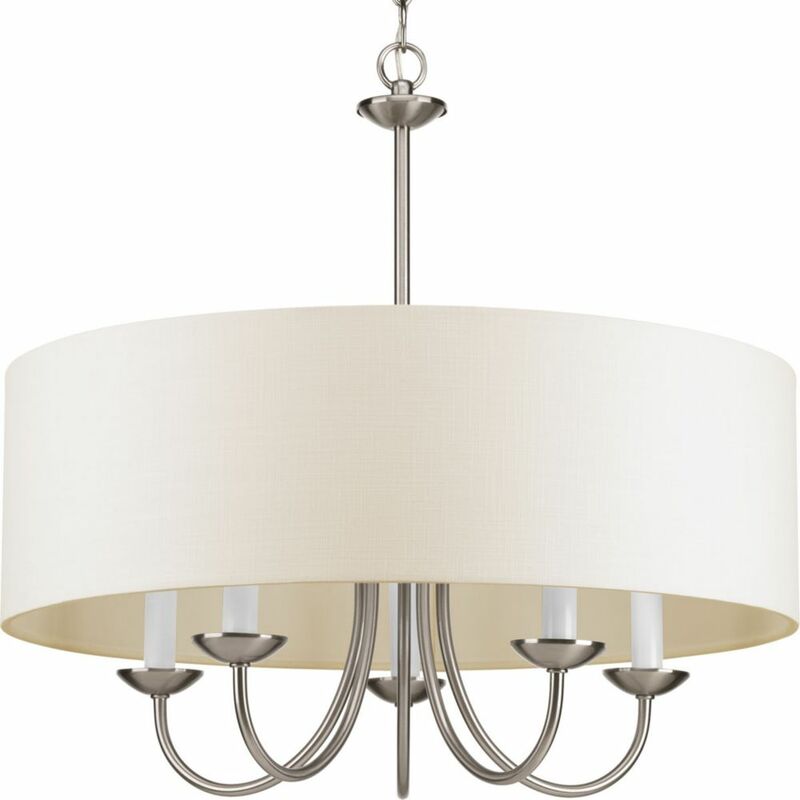 5-Light Chandelier in Brushed Nickel with Beige Linen Shade is rated 4.8 out of 5 by 60. Rated 5 out of 5 by Pat from Gave the dining room in our winter condo a nice... Gave the dining room in our winter condo a nice updated look for a reasonable price! Rated 5 out of 5 by HomeDepotCustomer from Nice light. ... Nice light. Thank you for your recent inquiry with The Home Depot. Yes, this light is dimmable, with a standard incandescent dimmer. If using LED bulbs please be sure the bulbs you purchase are dimmable. Thanks!